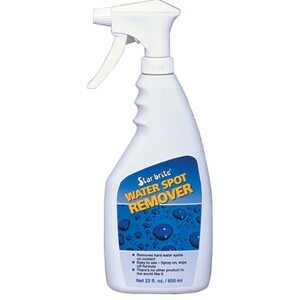 Instantly removes stubborn water spots from fiberglass, metal and painted surfaces. Non-abrasive and non-toxic. Simple spray on, wipe off formula. Instantly removes stubborn water spots from fiberglass, metal and painted surfaces. Non-abrasive and non-toxic. Simple spray on, let sit, and wipe off with a microfiber towel.